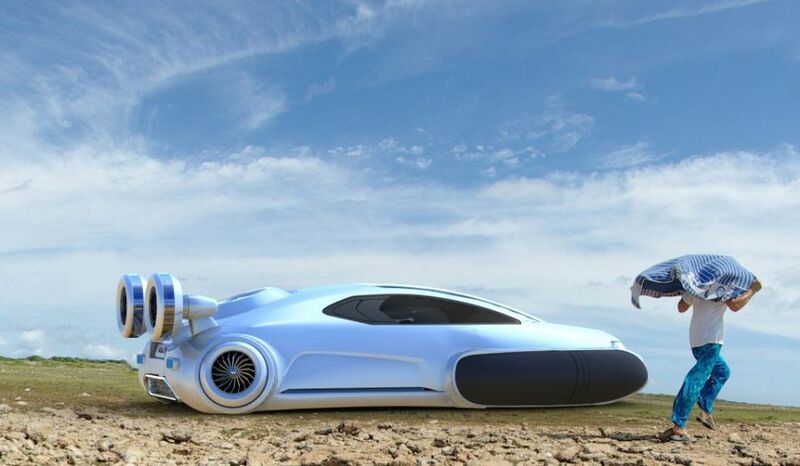 The Volkswagen Aqua is a futuristic hovercraft concept created by Yuhan Zhang, a 21 year old designer from China. Yuhan just graduated with honors from Xihua University with a degree in Industrial Design. The Aqua concept was shortlisted in the CDN Car Design Awards China, based on the brief entitled simply; "Chinese off-road vehicle" by Volkswagen. The competition was sponsored by the German manufacturer. The Volkswagen Aqua hovercraft concept is designed to deal with the huge variety of terrain which can be found across China. From the lakes, rivers and coastal waters, to roads, wetlands and snow and ice. The Volkswagen Aqua, like many hovercraft, uses more than one engine. The primary motor unit is powered by a hydrogen fuel cell, and is used to drive the main fan which inflates the rubber skirt around the vehicle. This then raises the Aqua just above the ground and provides lift. The fans at the rear of the Volkswagen Aqua are powered by individual electric motors to provide forward thrust and directional control. Cleverly Zhang has disguised the two outermost fans as rear wheels. And when the vehicle is powered down these retract into their housings. The styling of the Volkswagen Aqua hovercraft is extremely clean and minimalist. There's very little clutter to the lines, except perhaps at the rear due to the quartet of fans. The interior has space for two, and again its a rather Spartan affair. The driver controls the Aqua hovercraft using a telescopic steering wheel with an unusual flexible column. The instrument panel is fully digital. Perhaps our only area of concern is with how you actually enter the vehicle. See that small round hatch at the rear of the vehicle, the one located where the rear window would normally be, that's your one and only way of getting into and out of the vehicle.